Congrats to American Brewing for a very successful first year of business! American Brewing Company is proud to announce that it will be celebrating its one-year anniversary by hosting an open house (21 and older) Saturday, March 3 from 1 pm – 11 pm at their brewery, located at 180 W. Dayton St., Warehouse 102 in Edmonds, WA. The tasting room will feature live music by local artists Steve Stefanowicz, a rock and blues acoustic performer from 2 pm – 5pm, and Third Train Running, an acoustic blues and folk band from 7 pm – 10 pm, as well as snacks and finger foods. Along with their great flagship beers, American Brewing Company will proudly present brewer Skip Madsen’s newest, a hearty Scotch Ale! 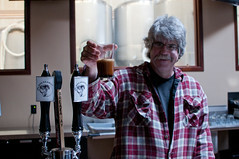 – Took on three distributors in the Western Washington region, and is about to add it’s fourth. – American Brewing Company 22 oz bottle labels, designed by Taphandles in Seattle, received an American Package Design Award presented by Graphic Design USA. – Was chosen as one of only 15 breweries from across the country to pour their beer in Washington, D.C. for more than 500 members of Congress and their staff at the Tenth Annual Autumn Capitol Hill Beer Tasting.